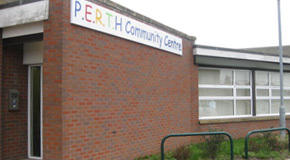 PERTH Community Centre is a voluntary run community facility situated in the heart of Thatto Heath. One of the Centre’s main aims is to provide Education and Recreation in Thatto Heath for local residents to access, enjoy and benefit from. It is now part funded by a Big Lottery grant. The PERTH Centre is open to all members of the community and at present holds a wide range of activities for the local people and groups to access – including a weekly community cafe, health checks, information and advice, accredited training courses, a weekly arts group and much more. Facilities available for hire include a Kitchen Café area, Activity Room, Boardroom Suite, One to One Room, IT/Meeting Room and a large Meeting Area, which are well equippped for local community groups and partner agencies to use. The Centre is fully accessible and has baby changing facilities, Wi-fi, Smart Board and access to a free car park. I find the PERTH Centre really helpful and friendly each time I have been in and the staff are really helpful and put themselves out if need be.